My name is Jonathan Hoerner from New Orleans. I am in a band called Bag of Donuts which is a tongue-in-cheek rock and roll band. It's like Mardi Gras all year long. 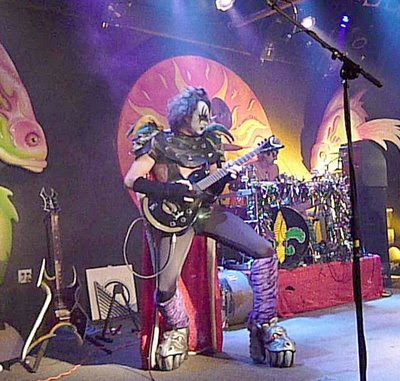 Everyone in the group dresses in costume and I chose the role of Gene Simmons of Kiss since this is what I grew up on. 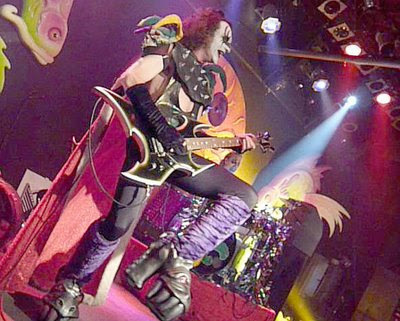 However it's more of a caricature of Gene rather than an exact replica. I had been making my own costumes with my father for many years and finally decided to get some professional costuming done. When it came down to the boots, I decided I wanted the real deal demon boots but I would change around the upper part of the boots and not get the scales. The man to do this I found was Barry. He was very easy to work with, understood what I wanted, and had the demon shells made sooner that he had promised. I couldn't have been more pumped when I took them out of the box. I anticipate working more with Barry in the future. If you have any questions, contact me at jchoerner@aol.com.